the move: before | . stephrything . Friday. Grandma left that day to go home. Her help the previous two weeks was crucial for us to accomplish all we had done. I packed up some more and played with J. He may not look large or menacing, but that's only because I kept my distance. I'd estimate him at two inches. We had just passed this spot in our hallway five minutes before. Haunting thoughts filled my mind. 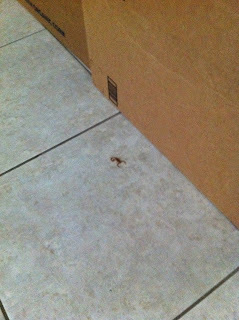 I had never killed a scorpion since Brent took care of the three others that had trespassed our house previously. Since Brent wasn't available, I quickly called friend Tim, since he's familiar with scorpions, and panicky-asked if I should know anything before attempting to kill my intruder. He said to grab a big shoe and be careful cuz they're quick. Great. I grabbed a shoe and paper towels, suppressing the urge to throw up while trying not to squeal because my apparent uneasiness was troubling Joaquin. I stared at the scorpion. He stared back at me. I feared his rumored quick reflexes would send him under a box or dash past me towards my son or dart right at me for an attack. I tried to compose myself by shaking off my scary thoughts and dry heaves. As I lunged forward to smash him he flinched. But he wasn't quick enough. I gave him a few good swats for good measure. Then it was over. More dry heaving and haunting thoughts. And wishing Brent were here. It honestly took a few hours before I completely calmed down. We had several appointments at the new house. First, the countertop guys came back to install a piece of quartz on our kitchen windowsill. 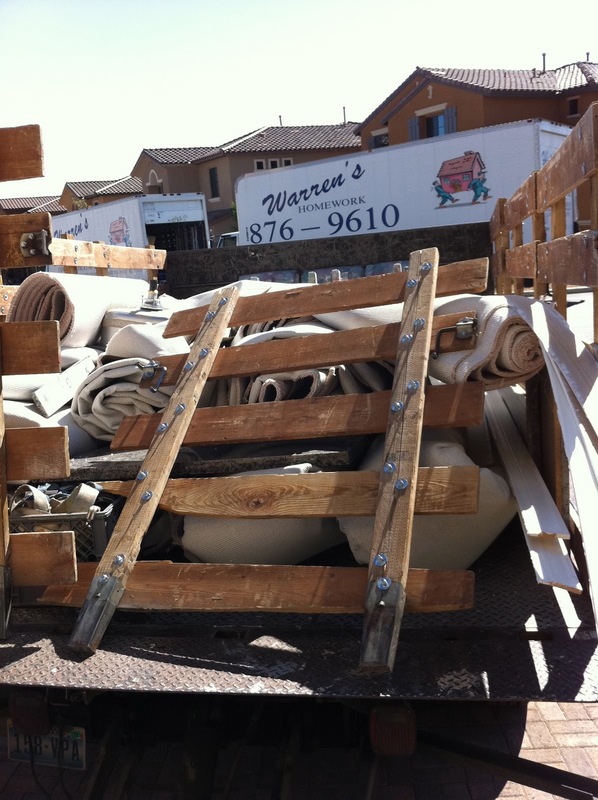 Then Habitat for Humanity showed up to pick up our carpet, granite, sink and baseboards. We were thrilled we could donate the materials we tore out. I didn't want it all to go to waste -- brand new, functional materials. The HH guys were super nice and grateful for our donation. I was grateful they could lift and load all that carpet and granite. Next, the cabinet guy came back to touch up some cabinet sides and install transition pieces around the cabinet bases and floors. Brent finished his bike race (yeah!) and we relaxed the rest of the day. Sunday. Brent and I took carloads of decorations, pictures, mirrors, and other breakables to the new house. We didn't want these things to go in the moving truck, and since we lived so close it went fairly quickly. We went to church, and while we were there Brent got a call from Budget truck rentals. They said another customer's truck broke down in Arizona and they had to give our big truck away, so we no longer had a truck reserved. And they left it at that. Seriously?! We were moving the next day! Brent called them back, put them in their place and told them to find us another big truck. We also found out the baseboards that were to be installed that day had been discontinued so the guys wouldn't be coming. Which meant the baseboards would be installed after we moved in. Ugh! We settled on our second choice for baseboards and hoped they could come on Tuesday. After church, I had another church activity to be at that night, so Brent went to the new house with J to meet a Direct TV guy to hook up our house. The TV guy arrived super late so Brent talked him into hooking up more rooms in our house for no extra charge. Talk about a day of frustrations. We went to bed hoping moving day would actually happen.